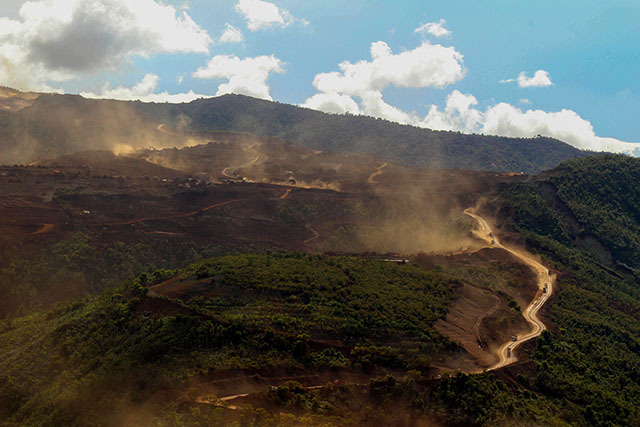 SURIGAO CITY (MindaNews / 3 Aug) – Mining firms in the two Surigao provinces are being audited by the Department of Environment and Natural Resources (DENR). Environment Secretary Gina Lopez said at least seven mining firms are now on audit to confirm whether or not there are violations in their operations. She identified these firms as Marc Ventures Development Corporations located in Cantilan, Surigao del Sur; Clarence T. Pimentel Mining Corporation and Carrascal Nickel Corporation, both operating in Carrascal town in Surigao del Sur; Platinum Group Metals Corporation, Adnama Mining Corporation and Taganito Mining Corporation, all located in Claver town in Surigao del Norte; Hinatuan Mining Corporation in Tagana-an town in Surigao del Norte; and Greenstone Resources Mining Corporation Inc. (GRCI) in Tubod town in Surigao del Norte. All of these companies except GRCI, which is mining gold and silver, are extracting nickel ore and shipping it to China and Japan. “We are looking at their operations and their impact to the environment,” she told MindaNews on Tuesday. Lopez said these provinces are beautiful but some portions have become ugly because of the mining operations. “I know talagang kawawa ang Surigao at sayang na sayang kasi maganda,” she pointed out. Lopez said the audit will be concluded this week. Sought for comment, former Surigao City Councilor Edgar Canda said Lopez should stop immediately the operations of mining companies in Surigao. “They never helped the people of Surigao,” he said. Canda pointed out that aside from destroying the environment, the mining industry could be blamed for the proliferation of illegal drugs, like shabu, in the area as its use has become rampant among heavy equipment operators.